IC-Switch is freeware, but if you like it please consider showing your appreciation by making a small donation via the PayPal button at the bottom of this site's pages. OS X 10.6.x (Snow Leopard) or newer (up to Mountain Lion) - Intel chips based Macs only (use the version 1.4 if you're on a PowerPC). Change the default application for a protocol (email, FTP, news, RSS or Web) in one click, from a "status item" menu displayed at all times on the right side of the menubar. Changes take effect immediately. Manage the presence and the contents of each submenu (Email, FTP, News, RSS and Web), adding and removing any application you want. Launch or reveal in the Finder an application by selecting it in the menu with a modifier key pressed down. Choose the icon to display in the menubar. Option to launch IC-Switch automatically at startup. IC-Switch comes with English, Japanese (thanks to E-WA) and French localizations. IC-Switch is a small background Cocoa application that talks to Internet Config. It only consumes a few resources when you edit the menus, and nothing the rest of the time. Also, IC-Switch doesn't have to run permanently; you can launch it when you need it, and the menu will then be installed. When you're done, you can select the "Quit IC-Switch" menu item: the application will then quit and the menu will be removed. Copy IC-Switch to a local disk (you can put it where you want). That's it, there's no need to restart the machine or the session. Just launch IC-Switch and start using it (If you don't see the menu, see Known Issues & Limitations below). Note: Since IC-Switch doesn't install anything in the system area, each user of a shared machine can install it without needing administrator rights. Also, each user is guaranteed to use and edit only his/her own Internet Config file. You may trash also the preferences file at "~/Library/Preferences/com.flip.IC-Switch.plist". (1) : alternatively, you can remove IC-Switch from the Login pane of the System Preferences application. You can also launch any application from IC-Switch menu by holding down the Control key when selecting the application, and you can reveal it in Finder by holding down the Option key. 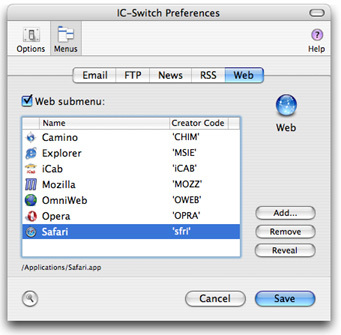 IC-Switch comes with one default application listed in each protocol. Also, each time it is launched, IC-Switch detects the application set as default in Internet Config for each protocol, and adds it to the corresponding submenu, if it's not already there. Use this checkbox to control whether this submenu will be displayed or not. Click on this button (or press cmd-O) to add a helper to the selected submenu. A standard file selection dialog will open and let you select an application. Select an application in the list and click on this button (or press cmd-D) to remove it from the list, and from the menu. Select an application in the list and click on this button (or press cmd-R) to see this application in the Finder. Click on this button (or press cmd-F) to get IC-Switch to detect the available helpers on your machine for each protocol (or at least most of them). From this popup menu, you choose the icon that IC-Switch will display in the menubar (the changes are applied when you click on "Save"). Power-user tip: Add your own icons to the popup by dropping tiff files whose name starts with "Internet_s" into the Resources folder of both IC-Switch and IC-SwitchPrefs. If you come up with nice icons (of yours) that you'd be willing to share, send them to me and I'll be glad to add them to the bundle (with due credit, of course). Check this checkbox if you want IC-Switch to be launched at login. Alternatively, you can add IC-Switch to the Login pane of System Preferences. Both commands are synchronized. If you need a quick reminder, click on the Help icon in the toolbar. Finally, when you're done, press "Save" to save your changes and close the Preferences window, or press "Cancel" to close it without saving the changes. IC-Switch may conflict (visually only) with some utility menus, such as Timbuktu's menu or Stuffit Deluxe's Magic Menu. More specifically, if you launch IC-Switch when one of these menus is already the left-most menu in the status items area (the right side of the menubar), the status item object doesn't seem to detect this menu and draws IC-Switch's icon behind it, or too close to it. In this case, try to command-click and command-drag this menu to the left. On the other hand, if you use IC-Switch regularly, make it launch at startup, and make sure it appears in the Login Items pane of the System Preferences application, before the conflicting application. In Jaguar, if the System Preferences application is running when you change a default application from IC-Switch's menu, you'll have to quit and relaunch System Preferences in order to get it to display the changes you've done from IC-Switch. However, even if the Internet pane fails to show it, the changes are stored in the Internet Config file and are effective as soon as they're done. Since Internet Config identifies the applications by their creator code, you cannot add to a same menu several applications with the same creator code. Of course, you can still add a same application in different menus, like having Entourage in both the Email and the News menu, for example. Similarly, if two different applications on your machine have the same creator code, the wrong one may be detected by IC-Switch when you press the magnifying glass button (this could have been the case with Chimera Navigator and Chimerachanga in IC-Switch 1.1b2 and earlier). IC-Switch now has a way to work around this problem, but it has to be "instructed" to do it. So please let me know if this happens to you. If IC-Switch happens to hang (it doesn't on my machine, but who knows? ), you'll find out that as background application it isn't referenced in the Force Quit Applications window. If you need to force quit IC-Switch, you can do it from the Process Viewer application (Activity Monitor in Panther). I learned how to access InternetConfig by studying the OmniAppKit framework by Omni Development inc. Thanks to the Omni team for their great frameworks and applications. Thanks to my boss, Philippe Bardon for getting me on Mac OS X in the first place. Thanks to Matt Neuburg for his design suggestions and beta testing. Thanks to Corentin Cras-Méneur, Seth Dillingham, E-WA, Nick Greeves, Bruce Lacey, Sean McMains, André Radke and Brent Simmons for their beta testing and feature requests. Thanks to E-WA for the Japanese localization. And thanks to everyone who worked on InternetConfig. IC-Switch wouldn't be what it is without all these great people! IC-Switch: Copyright © 2002 - 2019 Philippe Martin. IC-Switch is free software: you can redistribute as you want as long as you don't make any profit of it, and as long the original readme files are joined. 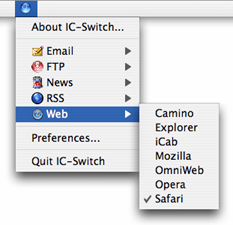 Internet Preferences Icon and some toolbar icons: Copyright © Apple Computers, inc.
IC-Switch is now built exclusively for Intel processors (stick to the 1.4 if you're on a PPC). As a side effect, the preferences format has changed so your old preferences, if any, will be lost (it's not like it takes hours to set it up anyway, is it?). IC-Switch 1.4 goes GM. Only the version number changed. Completion of the Japanese localization. Out of context conflict alerts no longer occur when detecting helpers. Addition of several applications to the list used for detection. Fixed an error launching IC-SwitchPrefs in Jaguar (doh!). Thanks to Masato Ogawa! IC-Switch 1.3 goes GM. Only change is the version number. Minor changes in Japanese localization. The prefs window now remembers correctly the selected tab of the Menus pane across sessions (that bug too had been introduced in 1.2). Quitting IC-Switch Prefs from the Dock no longer leaves the IC-Switch menu disabled (it's now equivalent to using the Quit menu item or clicking on Cancel). The "Add Helper..." and "Find Helpers" menu items are now disabled when the Menus pane isn't selected. Japanese localization completed (thanks, E-WA!). Fixed a conflict with Ittec which led it to attach its submenus to the icons menu in the preferences window (thanks to Corentin). Show as selected the toolbar item of the current pane (on Panther). Updated for Panther (both functionally and cosmetically). Added an option to control whether each submenu is displayed or not (thanks to Bruce Lacey's request). Display the seleted helper's path (in the preferences window). Added some Tool Tips to the preferences window and fixed some others in the French localization. Japanese localization is completed (thanks to E-WA again). Fixed a potential crash and prefs corruptions when adding to a menu a bundle application that missed its CFBundleName (thanks to E-WA who identified this bug). Changed the submenus and tabs order to be alphabetical (they where in the same order as originally in Sys Prefs). LifTP should now be detected when using the find feature. Added a couple of people to the credits in the About box, to thank them for their great contributions. Addition of the FTP protocol (thanks to Seth Dillingham's insisting request ;-). Changing the News helper now controls the 'news' protocol in addition to 'nntp' (thanks to Seth again). Rework of the preferences window, with the addition of a toolbar and an Options pane (it was getting too much tabs). Addition of an option allowing the user to choose IC-Switch's menu's icon (thanks to Brent Simmons' request). Power-user tip: add your own icons to the popup by dropping tiff files whose name starts with "Internet_s" into the Resources folder of _both_ IC-Switch and IC-SwitchPrefs. If you come up with nice icons (of yours) that you'd be willing to share, send them to me and I'll be glad to add them to the bundle (with due credit, of course). Few updates to the help text to reflect the changes. Final candidate released to beta testers. Added a way to check the name of detected helpers, so Chimerachanga will no longer be found instead of Chimera Navigator (they have the same creator code). Now IC-Switch changes the https helper along with the http one. Updated the help and the Readme files. Japanese localization was added, thanks to Yuzuru Shiraiwa. IC-Switch now displays icons in its menu, showing at the first level the selected helper for each protocol. It's now possible to get IC-Switch to search automatically for helpers from the preferences window, by clicking on a button or by typing cmd-F. Reveal helpers in Finder from the preferences window, and from the menu (by selecting a helper with the option [alt] key pressed). Launch a helper from the menu, by selecting it with the ctrl key pressed. All the commands available in the preferences window now have a corresponding menu item and key equivalent. The preferences window now remembers the last tab you used. The option to launch IC-Switch at startup has been improved. Now if you enable/disable IC-Switch startup launching from the login pane of the system preferences, IC-Switch will detect it. Better behavior when the user selects an application already referenced, or an application that has the same creator as an application already referenced. Added the "About IC-Switch..." menu item. Now that I learned how to call Carbon from Cocoa - thanks to Andrew Stone's Cocoa_Files (*) - the OmniAppKit, OmniBase and OmniFoundation frameworks are no longer needed. So, IC-Switch is now only 300K. 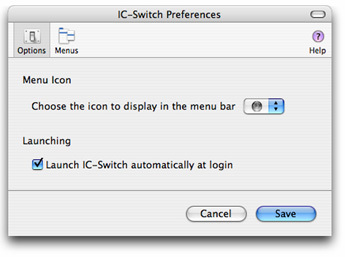 IC-Switch now opens the preferences dialog automatically only the very first time it is launched (previously, it opened it each time it was launched as long as the user didn't change the preferences). Now it detects at launch time the default application used for each protocol, and adds it to the corresponding submenu and to the prefs window if necessary. Fixed the links to the frameworks.